Combine all ingredients in a tall dish and microwave 3 minutes. (Or cook on the stovetop until it’s firm enough to scoop out in ball shapes.) Scoop into balls on a cookie tray (I used a melon baller, but a spoon or ice-cream scoop will work.) Cook at 360 F for 14-16 minutes. (Or maybe even cook the balls in the microwave?? But I haven’t tried this.) Let cool before removing from tray. Makes around 12-14 cookies. 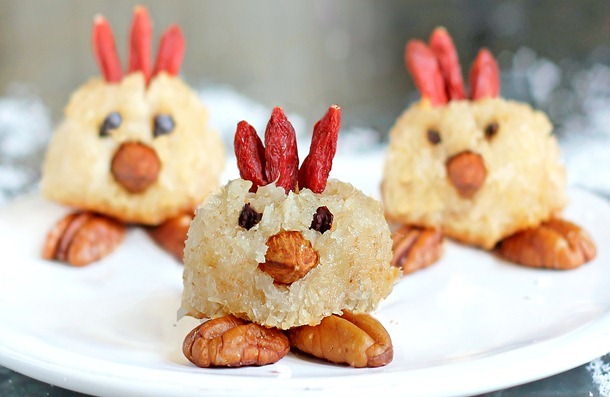 For chicks: Once cooled, get creative with whatever ingredients you have on hand. I used pecans, almonds, cacao nibs, and goji berries. No one says you have to make chicks… you can make bunnies! For a great ZUMBA class, click here.